John Kerry's Awkward Push For Investment In Iran : Parallels The secretary of state negotiated the nuclear deal and wants it to work. He recently went to Europe to encourage banks there to invest in Iran. 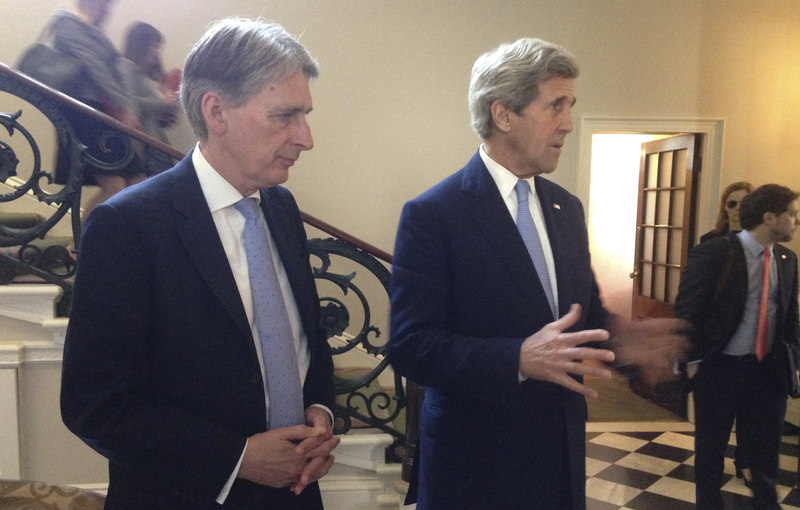 U.S. Secretary of State John Kerry (right), along with British Foreign Secretary Philip Hammond (left), speak to reporters in London on May 12. They tried to assure European banks they won't be penalized for conducting legitimate business with Iran. Critics say it should not be up to the U.S. to encourage investment in Iran. Secretary of State John Kerry has negotiated himself into the odd position of explaining to Western banks how they can do business in Iran. As he tries to keep the Iran nuclear agreement on track in the final year of the Obama administration, Kerry has become personally involved in trying to help Iran get economic benefits out of the deal. That's no easy task and one that critics say is letting Iran off the hook. Kerry huddled with European bankers in London on May 12 to tell them "legitimate business" is available to them in Iran. He took Treasury Department officials with him to "dispel any rumors" about how the U.S. will enforce its remaining sanctions on Iran. His spokesman John Kirby insists this isn't lobbying or advocating for investment in Iran. "It's about making sure legitimate questions by banking institutions get answered and honest concerns get addressed," Kirby wrote in an emailed statement. In speaking to bankers, Kerry emphasized that "as long as they do their normal due diligence ... they're not going to be held to some undefined and inappropriate standard." Many banks, though, are still wary of doing business in Iran. One reason, but not the only one, is that banks fear the possibility that U.S. sanctions could "snap back" if Iran violates the nuclear deal. As promised, the U.S. has suspended sanctions under the terms of the nuclear agreement that Washington and other world powers negotiated with Iran last year. However, the U.S. still considers Iran a state sponsor of terrorism and says it routinely violates the rights of its citizens. So there are still some U.S. economic sanctions in place over these issues, which are separate from the nuclear deal. Stuart Levey, the chief legal officer for the bank HBSC, says his bank and others in Europe still have good reason to be reluctant to jump in. "Governments can lift sanctions, but the private sector is still responsible for managing its own risk," Levey, a former Treasury undersecretary for terrorism and financial intelligence, pointed out in The Wall Street Journal a day after Kerry met with bankers in London. "No one has claimed that Iran has ceased to engage in much of the same conduct for which it was sanctioned, including activity supporting terrorism and building and testing ballistic missiles," Levey wrote. He added that HSBC has no intention of doing any new business involving Iran. Kerry's lobbying efforts have also raised eyebrows on Capitol Hill. Ed Royce, a California Republican and chairman of the House Foreign Affairs Committee, accuses the Obama administration of "bending over backwards to accommodate Iran," rather than keeping up pressure to encourage Iran to change its behavior. Kerry was taking "the odd step" of reassuring foreign firms that Iran is open for business, Royce told a recent congressional hearing, while "other administration officials go so far as to say that Iran economic growth is in our national security interest." Iran agreed to limit its nuclear program in exchange for sanctions relief and the Obama administration argues that Tehran needs to see some economic benefits for the agreement to work. U.S. officials overseeing the deal say it has made the U.S. safer. Iran was a few months away from having enough material for a nuclear weapon, they argue, and now Iran is a year away from that. "Since Iran has kept its end of the deal, we must uphold ours," says Adam Szubin, acting undersecretary for terrorism and financial intelligence. He told a House Foreign Relations Committee that Iran is already seeing the benefits, opening new bank accounts and gaining access to billions of dollars in reserves. The nuclear deal has improved Iran's economic outlook, according to David Lipton, first deputy managing director of the International Monetary Fund, who visited Iran in mid-May. His report predicts GDP growth of 4 percent to 4.5 percent over the medium term, as Iran boosts its oil exports and its banks reconnect to the international financial system. Inflation in Iran has declined from 45 percent in 2013 to around 8 percent recently, the IMF adds. Despite low oil prices, Iran's Oil Ministry is trying to ramp up production, exporting 2 million barrels per day in hopes of soon reaching 2.2 million barrels per day. Iran needs investment, though, and that means access to the international financial system. That's where John Kerry's lobbying efforts fit in. Kerry's critics say Iran needs to show that it is following international rules and reforming its economy if it wants foreign investment and it should not be up to the Obama administration to make that case. The Financial Action Task Force, an international body that reports on the risks of money laundering and terrorist financing, remains "particularly and exceptionally" concerned about Iran's failure to live up to global standards. Iran also gets poor marks on corruption. It is ranked 130th on Transparency International's Corruption Perception Index and 118th on the World Bank's Ease of Doing Business list. Sen. Elizabeth Warren, a Massachusetts Democrat who supports the nuclear deal, told a Senate banking hearing that issues like corruption explain why companies are so reluctant to invest in Iran. "The United States should not fall into the trap of helping Iran rehabilitate itself," former Treasury Department official Juan Zarate told that same hearing. "The onus should remain solely on Iran to alleviate concerns about its activities, lack of transparency and failure to meet heightened global standards of financial integrity," said Zarate, who is now chairman of the Financial Integrity Network.